There’s a picture under a hut outside of the visitor’s center that shows a man who had been in up to his waist. He walked out onto the lake and the pitch, or tar/asphalt, sucked him in like quicksand. I thought this was pretty neat, and was curious to try it myself. But, unfortunately, they don’t let you do that kind of stuff anymore. Instead, I settled for a quick dip in one of the sulfur pools and leaving hand and footprints in my wake. 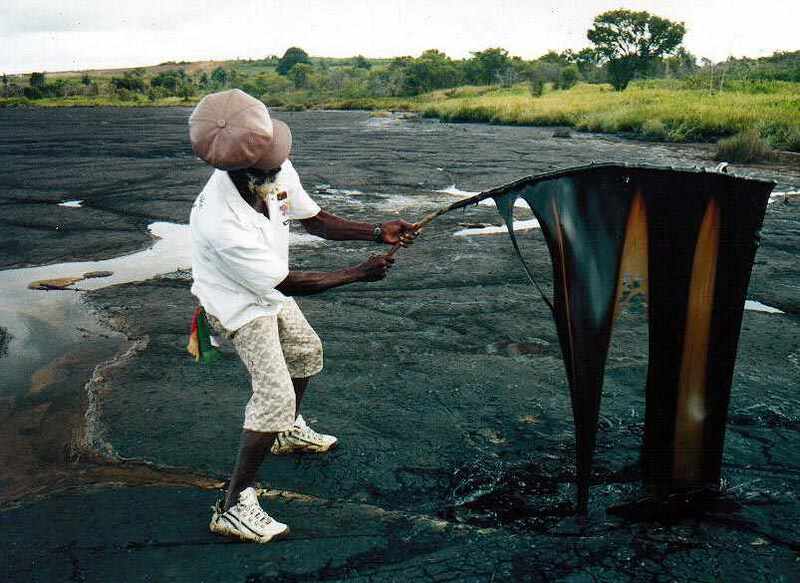 Classic photo of a guide pulling up the “pitch” at Pitch Lake in Trinidad. Pitch Lake is located on the southwest side of Trinidad, but you’ll probably feel like you’re on the moon at times. 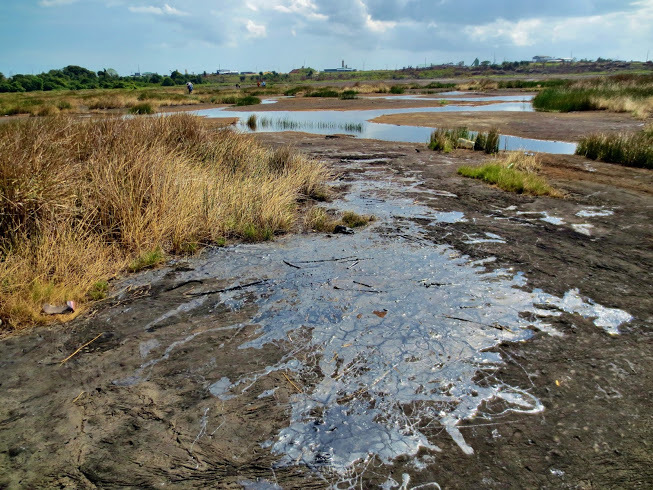 Called Tierra de Brea, it is a natural deposit of asphalt and sometimes referred to as a “tar pit.” It’s true – you can literally stick a stick into the ground, and up with it will come what looks like tar (see photo). 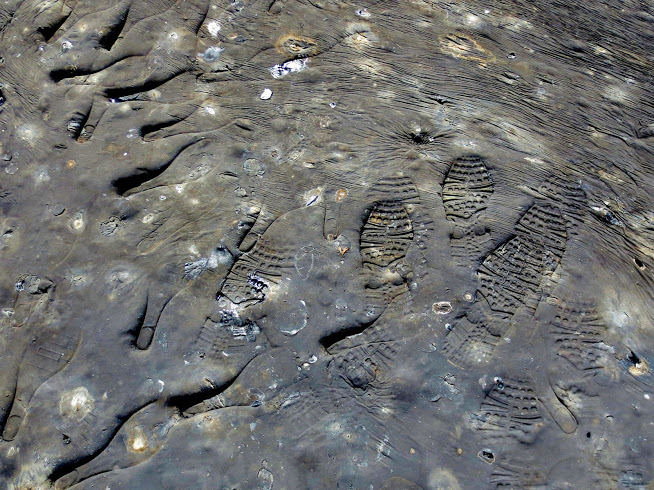 Stand in one place too long, and you’ll feel your shoes begin to sink in and create an imprint. According to most histories, Sir Walter Raleigh was shown the lake by locals when he arrived in Trinidad in search of El Dorado, the fabled city of gold. He found the tar to be great caulk for his ships, and was credited with its discovery when he returned home with several barrels. 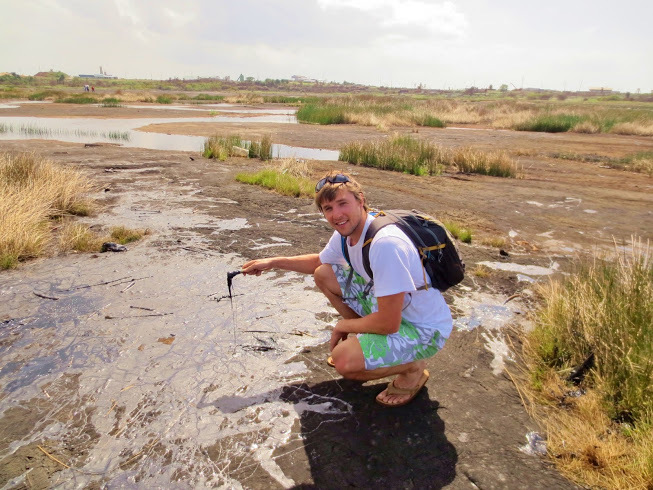 Despite being told on my tour that Trini’s Pitch Lake is one of only three of its kind, my researched showed that there are four other lakes: Three in California and one in Venezuela (although there are smaller deposits of asphalt found in various locations around the world, these are the only lakes). Pitch Lake is the biggest, measuring 246 feet deep and about 99 acres in size, and it is the most aggressive exporter of its product for road and runway construction in Europe and the States. The second-largest lake, Lake Bermudez in Venezula, halted its commercial mining operations back in the 1930s, and the pit in Los Angeles is dedicated to archaeological research and the preservation of the fossils found in the area. 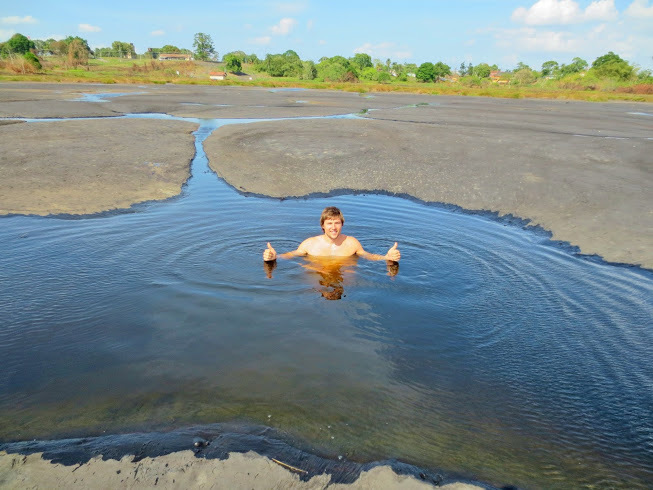 Pitch Lake in Trinidad. Photo by Wake and Wander. The area in Carpinteria is just south of where I used to live in Santa Barbara, and its presence is felt along the coast. I can tell you firsthand that there were many days when I walked out of the ocean near Santa Barbara and had tar on the bottom of my feet and bathing suit (I still have the stained suits to prove it) . Ironically enough, Trinidad has some of the worst roads in the Caribbean despite having such a supply of asphalt on hand. Apparently, they export most of the pitch to other countries, and I was told that having only two seasons (wet and dry) prevents the pitch from drying properly on the island, leaving the roads brittle. Whether that’s true or not, I have no idea. Scientists predict that there’s about a 400-year supply left underground — which really isn’t that long, although I suppose it gives Trini plenty of time to patch up some potholes if they so choose. 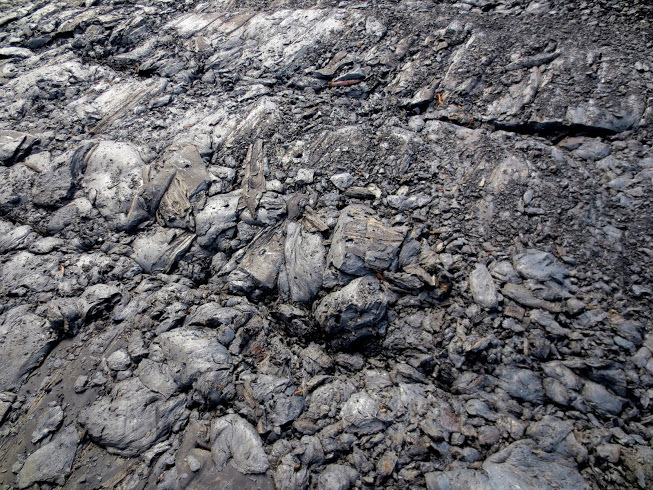 Another interesting piece of trivia is that the “pitch” – another name for the tar – is where the phrase “pitch black” comes from. Now every time you turn out the lights or get in your car, you can think of Trinidad. Not quite as impressive as the photo above, but all the same at Pitch Lake in Trinidad. Photo by Wake and Wander. Swimming in a sulfur pool at Pitch Lake in Trinidad. Photo by Wake and Wander. Moon-like terrain at Pitch Lake in Trinidad. Photo by Wake and Wander. 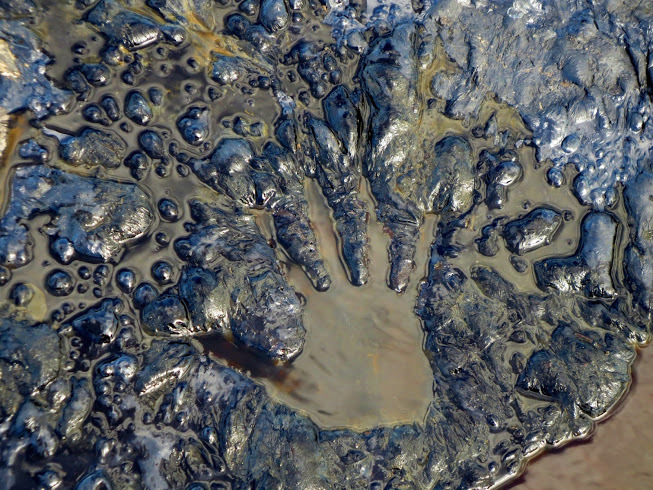 My hand print in Pitch Lake in Trinidad. Photo by Wake and Wander. My footprints in Pitch Lake in Trinidad. Photo by Wake and Wander. The pitch drop experiment is one of the longest running scientific experiments, in which a “solid” piece of pitch is placed in a funnel, and it flows over a very long timescale (because the viscosity of pitch is 230,000,000,000x that of water!). A droplet falls every 8-12 years, and since the experiment was set up in 1927, only 8 drops have fallen. The 9th drop is expected to fall sometime this year! WOW! That is really interesting. I want to see the video of it dropping. Thanks for sharing.